Port Vale have played their football at the Vale Park ground since 1950, prior to this they had played at The Old Recreation ground in Hanley since 1913. When Vale Park was being built it was dubbed the “Wembley of the North” due to its planned 70,000 capacity, it even had plans for a railway station attached to it. However, funds (as always for teams in those days) ran out and the full plans werent put in place, unfortunately the subsequent decline of the team meant the grand plans were never fulfilled. The picture below taken from a Football Review magazine shows how the football ground looked in the 70's. 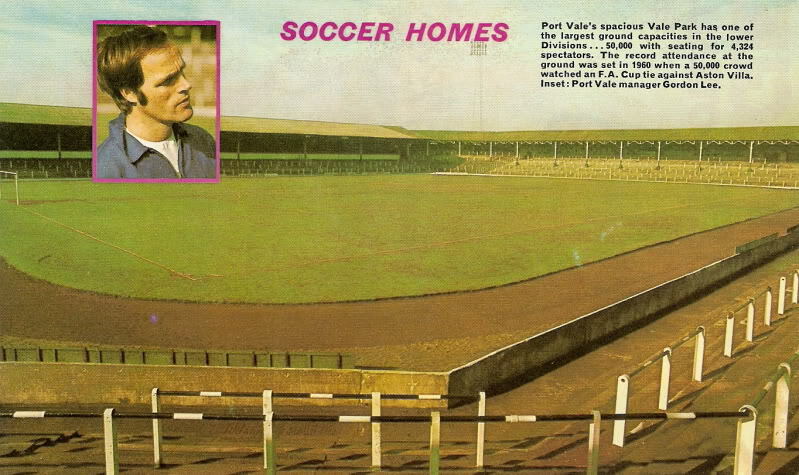 "Port Vales spacious Vale Park has one of the largest ground capacities in the lower Divisions...50,000 with seating for 4,324 spectators. The record attendance at the ground was set in 1960 when a 50,000 crowd watched an FA Cup tie against Aston Villa. Inset : Port Vale manager Gordon Lee." The picture above is available for sale (along with loads more Vale football memorabilia) on our main site Footybits, a link to which is at the top of this page.